During Speedy Harold Lloyd chases after his errant taxi by jumping on a passing car in front of 339 E. 57th St in New York. The four identical apartments to the east are now all lost to much taller buildings. 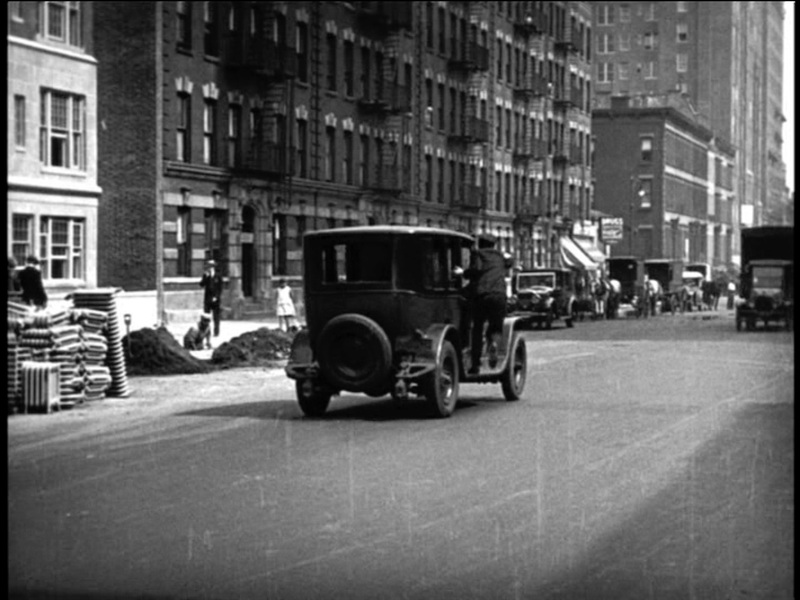 Harold Lloyd’s final silent comedy Speedy, filmed on location in New York during the summer of 1927, is a goldmine of vintage Manhattan locations. While my book Silent Visions devotes 100 pages to the dozens of NYC (and Los Angeles) appearances in the film, and my other posts cover Speedy in great detail, there always seems to be one more setting awaiting discovery. 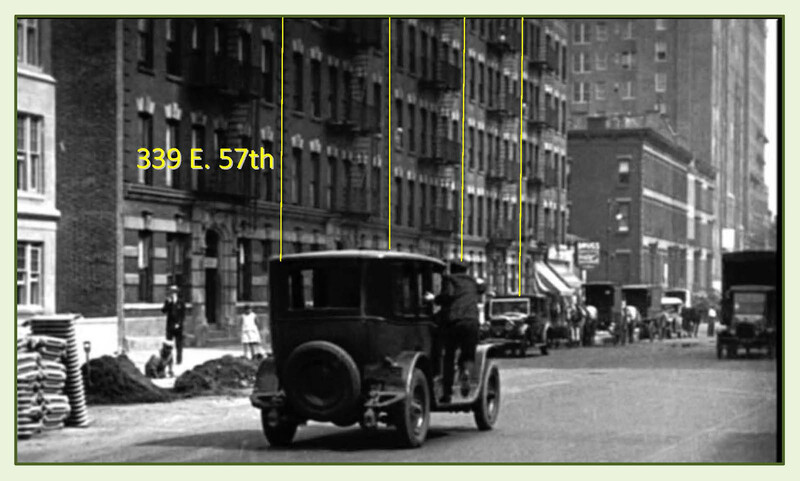 Momentarily stunned, Harold watches his taxi being towed east down E. 57th St. towards 1st Ave. Of the long row of five identical apartments depicted in the topmost image, only 339 E. 57th St. survives. Harold’s first day as a taxi driver is a complete disaster. His troubles begin when he mistakes a construction site supervisor, waving to a land surveyor, as a customer flagging down a cab (below). As Harold pulls over beside the active construction site, a painted wall at back advertises a number of 4-6-7 room apartments that will become available. Try as I might, this setting eluded my detection, but that 4-6-7 wall sign stayed with me. Looking to the NE, Harold parks beside the construction site for the 410 E. 57th St. apartments. The Queensboro (59th St.) Bridge appears at back. I recently had the honor of spending a few hours looking through the Harold Lloyd film storage vault, studying the photos on file. Aside from the thousands of 8×10 publicity stills taken to promote his films, Harold’s team also took a number of smaller 4×5 glass negatives, some candid shots, some location shots, to assist with production issues. Although I only had time to glance at a few of these 4×5 negatives, by complete chance I pulled a slide that had a 4-6-7 sign painted on a wall. When my friend Richard Simonton arranged to send me a “positive” scan of the shot, I could instantly see that this was the setting where Harold filmed. What’s more, the image revealed the future apartment’s complete address, 410 E. 57th St. Helping a customer with his luggage in front of the 410 construction site, Harold at first does not notice his cab being towed away. 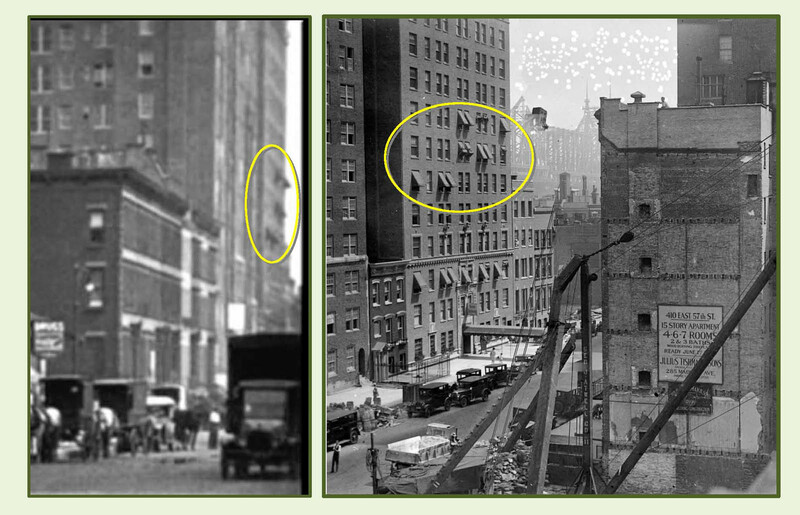 The red lines in each image above depict the same buildings along 419-433 E. 57th. I had hoped to solve this mystery early on by focusing on the modest scale Corn Exchange Bank branch visible on the SW corner of 1st Avenue and E. 57th St. during the scene (see left), but the bank once had twenty or more offices around New York, and so many Manhattan corner properties have since been upgraded that the spot eluded detection. A modern Chase Bank branch stands at the spot today. 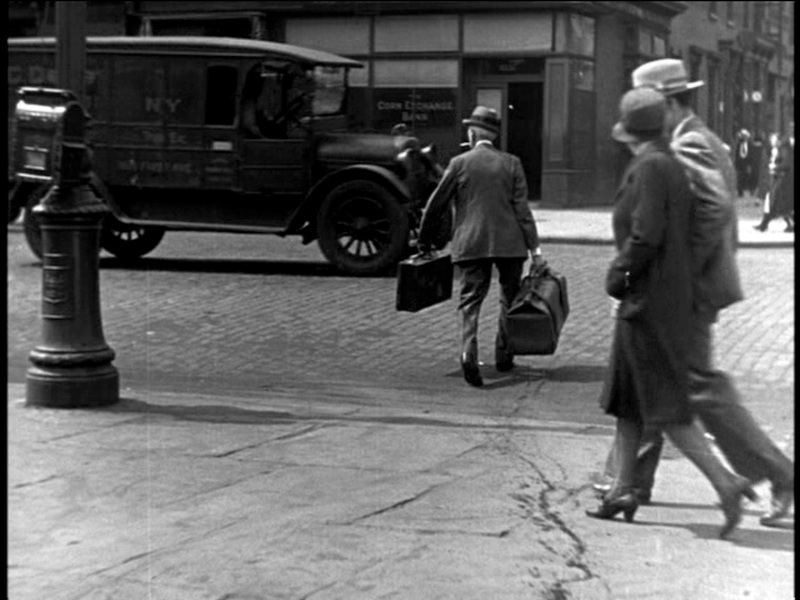 As Harold chases after his cab, his customer notices that the bottles of illegal booze hidden in his valise are now broken. 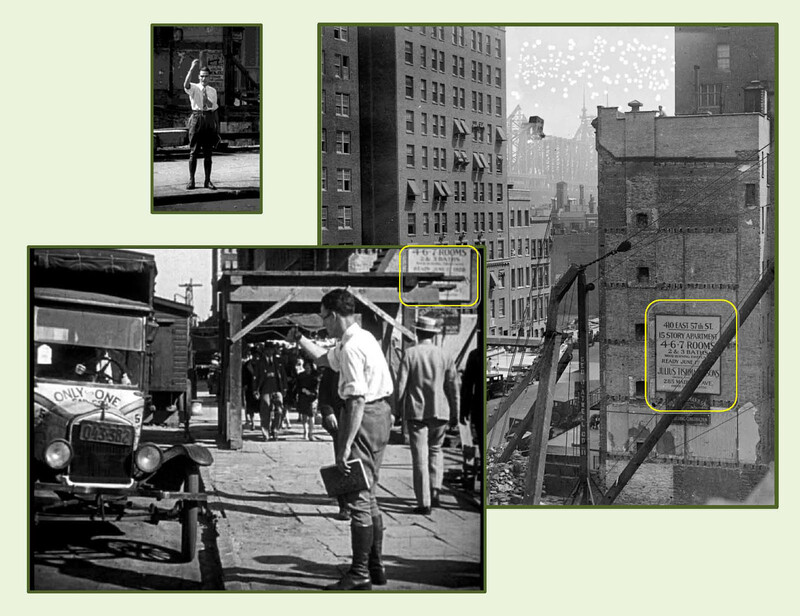 The red box marks the same extant buildings in each image. The world depicted by Speedy does not match geographic reality. Harold first chases after his taxi by running east along E. 57th St, from 1st Ave. Yet in the next shot (see left) he chases his taxi by jumping on a car going east along E. 57th St. towards 1st Ave. (see scenes at the top of this post). 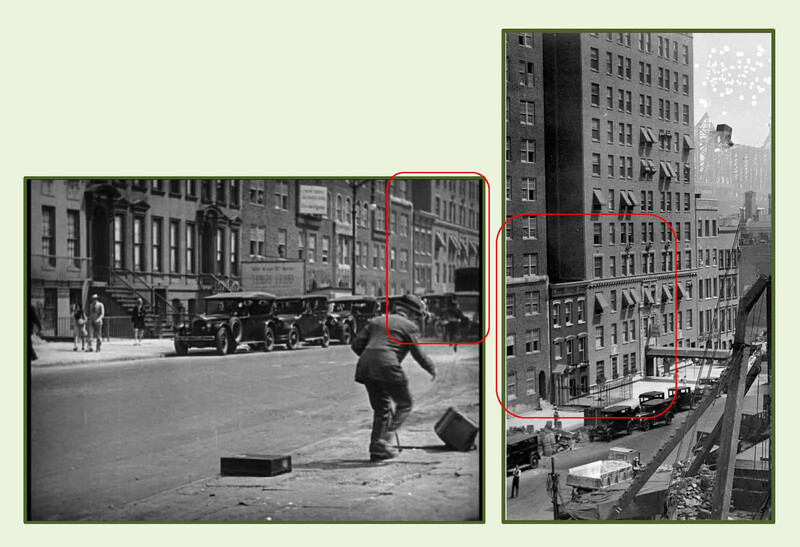 Thus, this later shot (left) looks east towards the prior spot where Harold filmed, revealing common details as shown below. The same apartment for rent sign appears in both movie shots. 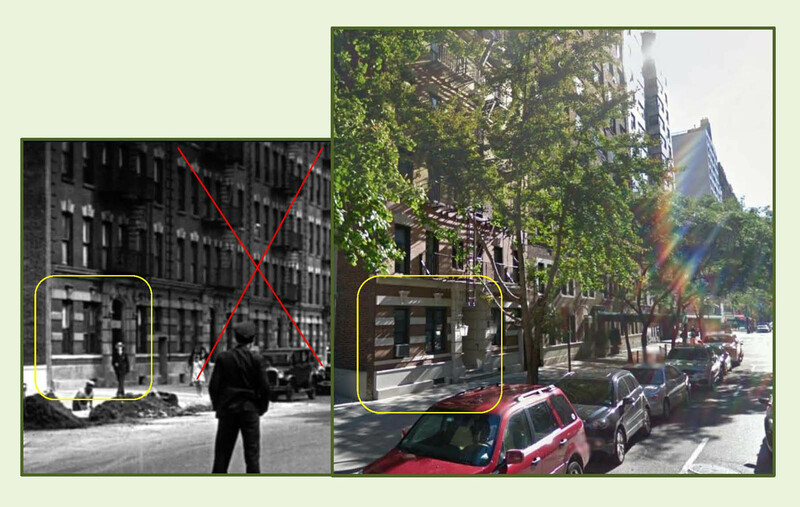 The movie frame looking east towards 1st Ave. also captures the apartment awnings appearing in the still photo. 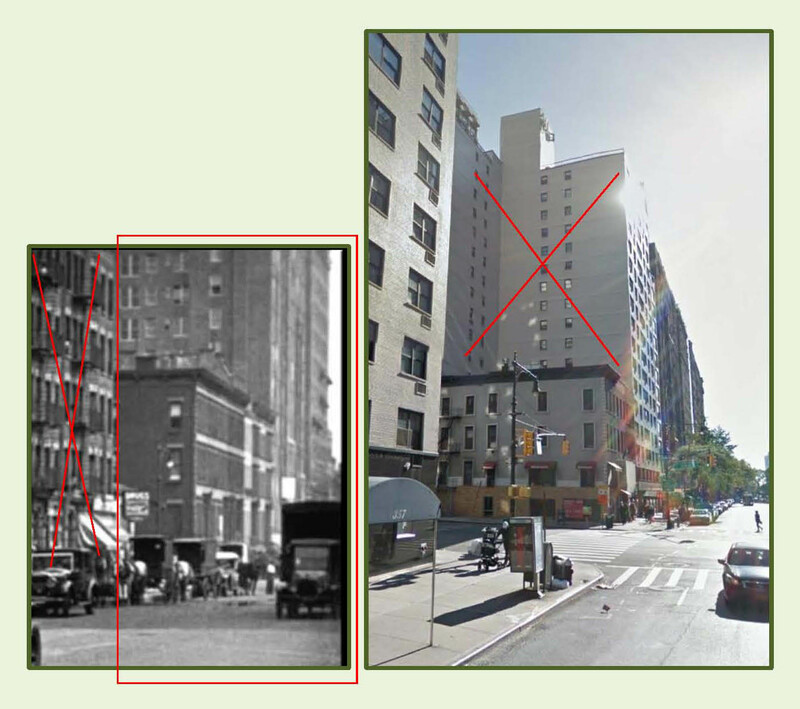 The view looking east towards 1st Ave. shows the same short building standing on the NE corner of E. 57th St. A tall modern apartment in the color view (X) stands where shorter buildings once stood. The scene with Harold chasing after his taxi continues with a sequence filmed in Los Angeles (!) looking towards the Mayfair Hotel where scenes from the noir thriller Edge of Doom (1950) and the hit television comedy The Office were filmed. You can read more about this location at this post HERE. Harold’s chase after his taxi continues next in downtown Los Angeles! You can read about it HERE. With this latest discovery on E. 57th St, fewer and fewer locations from Speedy remain undetected. HAROLD LLOYD images and the names of Mr. Lloyd’s films are all trademarks and/or service marks of Harold Lloyd Entertainment Inc. Images and movie frame images reproduced courtesy of The Harold Lloyd Trust and Harold Lloyd Entertainment Inc. Color images (C) 2014 Google. 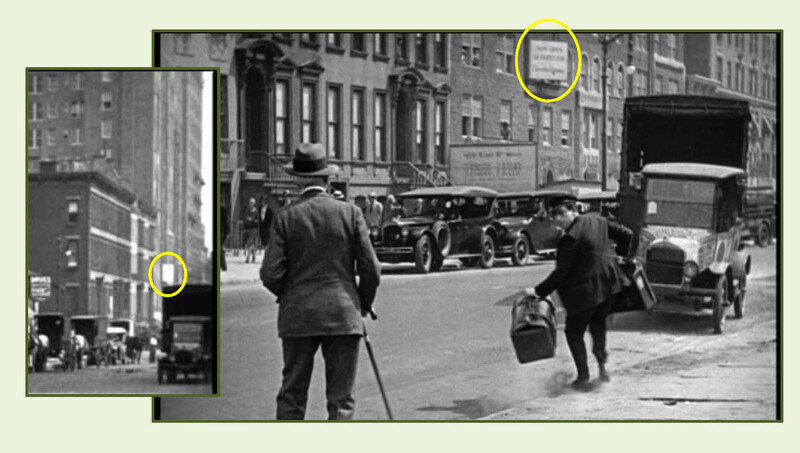 This entry was posted in Harold Lloyd, Manhattan, Speedy and tagged Edge of Doom, Harold Lloyd, Manhattan, Mayfair Hotel, Silent Comedians, Silent Comedies, Silent Movie Locations, Silent Movies, Speedy, The Office, The Office locations, then and now. Bookmark the permalink. As usual, I LOVE what you do and use it for reference and information. Thanks Marc – coming from you that is a real compliment. Thank you for all of the history you have preserved and share – it is absolutely invaluable. Outstanding detective work John. I applaud your monumental efforts, and thank you so much for sharing your knowledge! And now a question if you don’t mind. The 1931 movie “Street Scene” with Sylvia Sydney is shot almost entirely in front of a tenement building with a wide, sweeping staircase and the banisters are beautifully fluted. This building also shows up in the 1932 classic “Taxi” with James Cagney (it supposedly took place in Gramercy Park) and also in the 1932 movie “Strangers of the Evening”. Would you happen to know where this building was/is located or was it a built set? Thank you in advance! Thank you so much John. During the movie (Street Scene) there are several shots of the local EL at the end of the street. That’s what convinced me the building was real. Obviously they did a great job! Sorry John, I forgot to send you a picture of what I was talking about LOL! 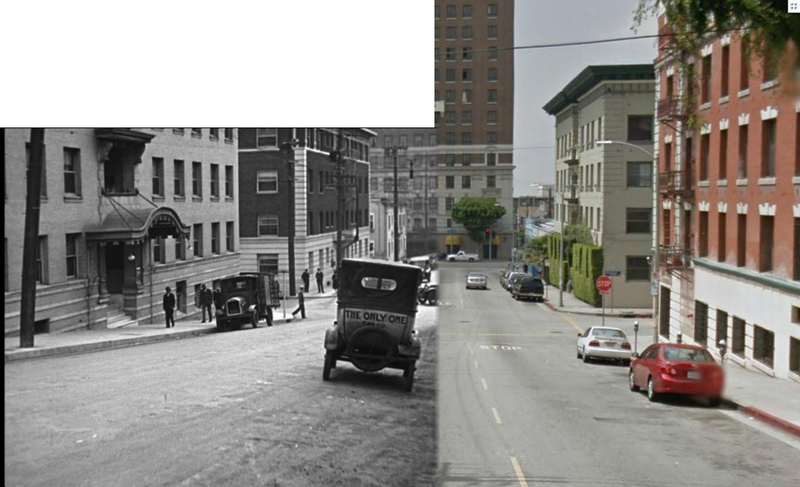 Taxi was just on TCM – as you mentioned, that same set from Street Scene appears in the Cagney movie. John, I found this post very exciting. I live around the corner from the Corn Exchange Bank site (a 3 minute walk). I believe there is a photo of it in nypl.org’s onlike digital photograph collections, findable by searching 57th street + first avenue. I had wanted for a while to write you and ask if you knew where these scenes with the leaking suitcase might have been shot and I am so happy to hear where it was! About Street Scene- and I am happy to hear about the building being in other films too- the stage set was very celebrated and was copied for the film and I think for the 1947 Weill opera on Broadway. It was based on a real building on West 65th Street on the block west of Central Park West that gave way in the 60’s or 70’s to a large hospital or institute for the blind, I think. I don’t have the exact address at hand but the info is in a book, The New York Stage in Photographs. And speaking of Taxi, Cagney has always been right at the top of my all-time favorites but I have to admit, I would have married Loretta Young just so I could look into those great big baby blue eyes of hers every day! I will still marry Loretta Young if it is at all possible. It is weird that she and her ex-husband made The Second Floor Mystery? together after their marriage was annulled- she was 16 I think- I hope it was not a painful film to make.